Camshaft locking pin – No.111589031500. Camshaft retaining tool – No.642589003100. Timing chain to camshaft sprocket holding tool – No.642589014000. Timing chain link kit – No.602589024000. Timing chain link separator (item 2) – No.602589046300. Timing chain link separator (item 3) – No.602589046301. Timing chain link installer – No.602589003900. Timing chain link installer die kit 1 – No.602589026300. Timing chain link installer die kit 2 – No.602589036300. Timing chain link installer die kit 3 – No.112589096300. Ensure timing marks on rear of camshaft gears aligned  . Ensure timing marks on rear of camshaft gears aligned with upper edge of cylinder head  . Ensure balancer shaft timing mark aligned at 12 o’clock position  . NOTE: Bolts for camshaft sprocket MUST be renewed. 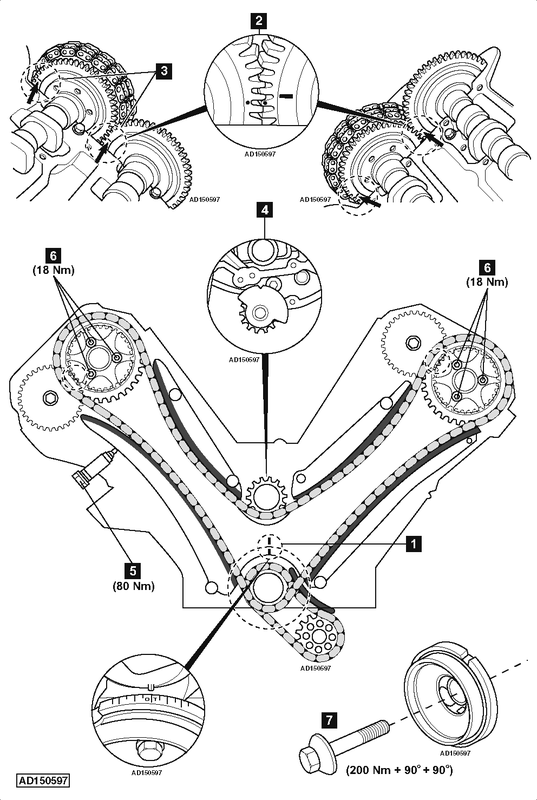 Tighten bolt of each camshaft sprocket to 18 Nm  . Install tensioner after engine repairs  . Tightening torque: 80 Nm. Tighten crankshaft pulley bolt  . Tightening torque: 200 Nm + 90° + 90°.